While smoking a cigarette in an alley by the seafood restaurant in Kota Kinabalu, I meet some unique acquaintances. “Hi friend,” someone says to my back. Six or seven young kitchen workers huddled in a circle smile back. I thrust my cigarettes towards them. They all crowd around me and grab a stick. Members of Alpha Kappa Rho (AKP 73) in Kota Kinabalu, Malaysia. They throw up their organization’s symbol with their hands, proudly displaying another trademark of the gang — a circular burn branded into the flesh of their wrist just under the palms of their hands. Visible on two members in the back row middle. “Terima kasih, terima kasih!” They chant. This means ‘thank you’ in Malaysian. I introduce myself. The oldest of the group is 21. His name is Adz and he speaks English. They pull out a small, blue stool and insist I sit. The tiny plastic thing crumples under my weight and I find myself on the ground. We all laugh. They bring over an empty propane tank for me instead and lend me their headphones so I can hear what kind of music they’re listening to. We bond over cigarettes, laughter and music. Before extinguishing my smoke and saying goodbye, I notice a quarter-sized burn on Adz’s wrist. I observe the others. 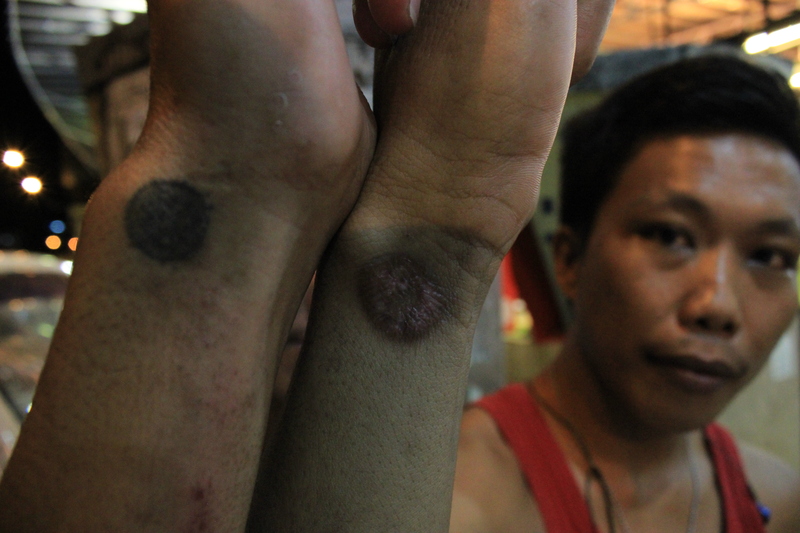 They motion at their own similar markings, proudly exhibiting the circular branding burned into their flesh. I stare at them in awe. They then extend their index and pinkie fingers at me, holding their middle and ring fingers down with their thumb: the gang’s symbol. Known more officially as Alpha Kappa Rho International Humanitarian Service Fraternity and Sorority, AKP73’s official name is as dubious as the organization itself, its purpose and existence. A “brotherhood” of hundreds of chapters that spans the globe, including North America, Adz and his friends are all members. 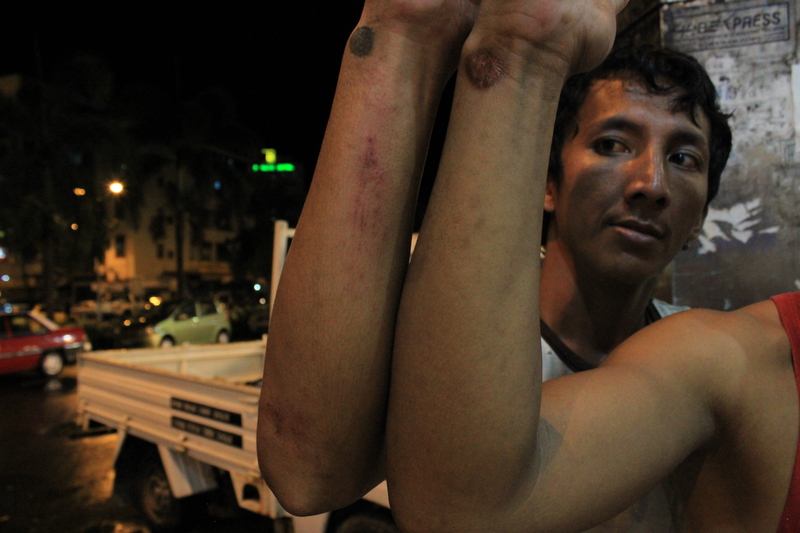 Beneath the skin of Malaysian streets lies a fraternity-gang culture. Not explicitly criminal, but neither law-abiding nor necessarily peaceful. The organization claims to be a scholastic fraternity and was established at a university in the Philippines in 1973. However, such a classification is likely a cover and I think the group has made a departure from its original intentions, depending on which chapter you look at. A symbol of brotherhood. 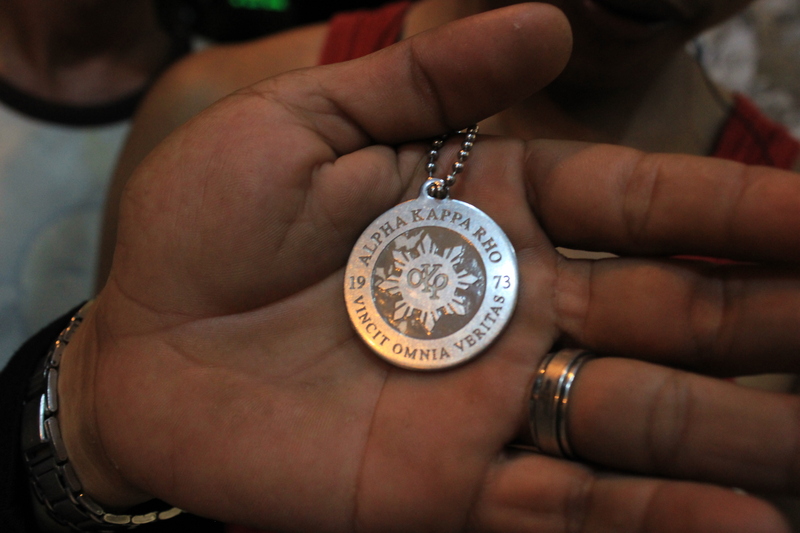 A silver medallion necklace of AKP 73, which was heated up and burned into Adz’s and other members’ arms when they were initiated into the gang-frat. In researching the group, it’s tough to find much legitimate information. Some websites praise the organization. Others are quick to voice discontent, claiming the group is a violent, half-baked gang, quick to aggressive behaviour when threatened. So far, this blog best explains this facet of AKP 73 from an objective point of view. Another article by GMA Network, a major Filipino broadcaster, links AKP 73 to terrorist actions in Manila where a member set off a bomb that injured dozens of people. It seems most of the violence that AKP73 exacts is on rival gang-frat’s like Tau Gamma Phi. The two groups have been battling it out for decades. AKP 73 members, and guys like Adz, have the potential to be friendly to outsiders who aren’t involved, as demonstrated by their decision to let me film and interview them. Adz and another Kota Kinabalu AKP 73 member proudly exhibit the memory of their initiation rites. The burns symbolize AKP 73. A Filipino national, Adz and his friends claimed they joined AKP73 for protection. Adz was initiated into the gang in December 2012. Their involvement in criminal activity is ambiguous. Perhaps the most startling of the stories of Adz’s pseudo-gang lifestyle was his initiation into AKP 73. In high school, people thought it was cool or a sign of toughness to burn cigarettes into their arms. This was often at parties and in a state of reckless intoxication. Adz and his crew would make these kids whimper. The circle of trust. Physical self-sacrifice and the large, round markings on AKP 73 members’ wrists is a symbol of loyalty to the organization. The circular burns are a symbol of membership, loyalty and trust to AKP 73. Talk about devotion. The silver AKP 73 medallion (pictured above), is placed under a flame until scorching hot. It was then pressed into Adz’s wrist for five to 10 seconds while he was held down and blindfolded. This makes a self-inflicted cigarette burn seem like a walk in the park. “Want to see what happened to my legs?” He says excitedly, whipping out his Blueberry (knock off Blackberry) phone to show me a video. Dozens — maybe 50 — young people sit on their knees blindfolded. A senior AKP 73 member walks around directing other members to repeatedly strike the blindfolded participants with a heavy blunt wooden object as big as a fence post. Shrieking in pain, they crumple to the ground like houses of cards. These blows to the rookies flowed as naturally and swiftly as water from a waterfall. This ritual lasts for 30 minutes. The circular burn means he will be accepted in any part of the world where there is an AKP 73 chapter. Welcome to life in AKP 73. All nice guys, I pray that Adz and his crew stay safe in this mysterious gang-fraternity culture of northwest Malaysia. View the video I filmed and edited at the top of the post to see exclusive footage from Adz’s initiation into AKP 73. Thanks Rodney! What piqued your interest in AKP73? nice one brother. im also a member of Alpha Kappa Rho in sandakan sabah malaysia. AKP is a fraternity not a gang. salute.